The fastest and least expensive way of getting a lush, green lawn is to hydroseed. Hydroseeding was once used solely for commercial purposes--especially by road crews on the sides of highways. Now homeowners can hire a contractor to spread the seed mixture for the quick establishment of a beautiful lawn. Hydroseed is a mixture of water, glue, fertilizer, seed and green wood fiber mulch. Once it dries, the mulch helps the seeds grow fast because it protects them. You will have a fantastic-looking yard in two weeks, versus six to eight weeks for traditional grass seed. Clear the planting area of debris, weeds and stones. Hydroseed needs direct contact with soil to become established. Till the top 4 to 6 inches to loosen the soil. Figure out the acidity or alkalinity of the soil with a pH test kit (available at a nursery or planting center). Follow the kit's instructions for gathering a sample. Make acidic soil more alkaline because grass grows best in a neutral environment. To boost the pH by one point, apply hydrated lime to the local soil. The rule of thumb is to add 4 oz. per square yard of sand, 8 oz. for loamy soil, 12 oz. for clay and 25 oz. for peat soil, according to the Garden Helper, an online gardening resource. Increase acidity if you're dealing with alkaline soil. Lower the pH by 1 by adding 1.2 oz. of ground rock sulfur per square yard of sand. For all other soil varieties, add 3.6 oz. per square yard. Combine the substance into the local soil well. Hire a hydroseeding contractor to come and spray the grass seed mixture in your yard. They should also lay down a starter fertilizer containing a lot of phosphorus. This will get the roots to start growing. Water the hydroseeded area twice daily to help it become established. Keep it moist because seeds will die if they dry out. Mow the lawn when the grass reaches 3 inches in height. Cut it no shorter than 2 inches to promote growth and thickness. Fertilize the grass after it has had 1 month to grow. 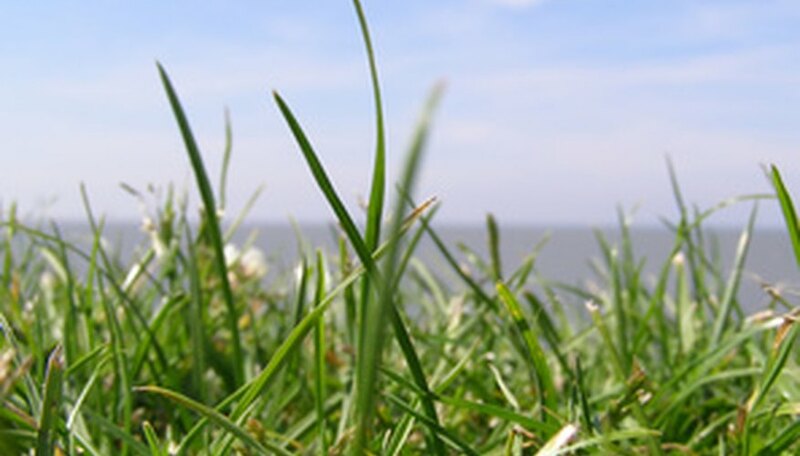 For the greenest lawn, use a food that is high in nitrogen. Follow the application instructions on the label. Stay off the hydroseed mulch mat while it is becoming established. If dealing with very acidic soil, do not try to correct it all at once. Take several weeks to gradually increase the pH.